Congratulations on your acceptance to the Nell Hodgson Woodruff School of Nursing at Emory University, one of the most prestigious nursing programs in the country! This website contains information critical to finalizing your student requirements. Please bookmark this site and check back often for important updates. For questions pertaining to the MSN program and/or program requirements, please contact nursingquestions@emory.edu. Download a printable Admitted Students Checklist. Download information on Parking Permit Registration. Your new Emory University email address is your OPUS ID@emory.edu; your password for OPUS and your email will be the same. You will be notified when you are able to access your Emory email account. You are responsible for accessing, reading, and responding to communications sent to your Emory email, accessible here. It is highly recommended that you check your Emory email daily. Online Pathway to University Students (OPUS) is the online student information system through which you can update your personal information, view your financial aid, access your student account or student record, and perform other functions. You are able to update your mailing address, email addresses, and phone numbers in OPUS. We highly recommend that you update your preferred mailing and email addresses as soon as possible. You should also make sure that you are signed up to receive emergency alert notifications from Emory University. You can do so by logging into OPUS and clicking on the Emergency Alert link under the Personal Information tab of your OPUS homepage. Provide documentation of enrollment in a comparable United States-domiciled plan. Students wishing to waive enrollment in the Emory Student Health Insurance Plan will need to complete the annual waiver process via OPUS by May 1 for AMSN students and Aug. 1 for BSN/ABSN students. For information about student health insurance requirements and the health insurance waiver, please click here. If you still have outstanding prerequisites, please send an updated transcript with those grades as soon as possible. If you do not complete your courses early enough to have an official transcript mailed, you must bring an official transcript with you to Orientation. Failure to provide a final transcript documenting completion of all prerequisites will result in withdrawal from classes. All incoming Emory University undergraduate students are required to complete the Sexual Assault Prevention education training module. SAP-U is an online learning platform designed to educate students on preventing and responding to interpersonal violence in the Emory community. It takes approximately 45 minutes to complete. Please refer to the detailed instructions for log in information and technical support. All incoming Emory University graduate students are required to complete the Sexual Assault Prevention education training module. SAP-G is an online learning platform designed to educate students on preventing and responding to interpersonal violence in the Emory community. It takes approximately 45 minutes to complete. Please refer to the detailed instructions for log in information and technical support. Billing is in progress, and you will be able to use OPUS for all account activity. Please click here for more information. All nursing students are automatically registered and cannot choose the time or day of their courses. Because nursing students are mass enrolled into their classes each semester, you and your classmates will have the exact same schedule. You will receive your official class schedule during orientation. Emory University is committed to providing all students, faculty, and staff the opportunity to succeed within the Emory community. The Office of Disability Services (ODS) assists qualified students in obtaining a variety of services (i.e., alternative testing, notetaking, interpreting, advocacy, mobility/transportation, etc.) and ensures that all matters of equal access, reasonable accommodation, and compliance are properly addressed. If you may need any of the services provided by the Office of Disability Services, please complete the registration process outlined here. As a new student, you will need to obtain an official university ID (mandatory for all students). You can use your EmoryCard to access a wide variety of services both on and off campus. Learn about EmoryCard photo standards. If you intend to park on campus, you will need to register for a parking permit. Parking deck assignments are made on a first come/first serve basis.Please refer to the Transportation and Parking website for online parking registration dates. If you have any questions feel free to contact the Parking office at 404.727.7275. Please review the parking regulations on Transportation and Parking website before completing your registration. Students are not permitted to park in the Wesley Woods parking lots. Emory encourages its students to explore all transportation options for travel to campus before registering to park on campus. Options including public transportation, Park-n-Ride, and carpooling are outlined on by the Office of Transportation and Parking. The cost savings — several hundred dollars — are significant. Please check with your Specialty Coordinator for information about appropriate clinical attire. White, mid-thigh length lab coat with or without the School of Nursing emblem embroidered on the left upper chest area in navy blue thread. Your nursing uniform must be purchased from Emory University Barnes & Noble Bookstore (Oxford Rd Bldg., 1390 Oxford Rd., Atlanta, GA 30322) or Uniform Advantage (Emory students receive a 10% discount). Your Official University EmoryCard will have PROX access and allow for access into restricted areas at the hospitals during clinical rotations. The cost of the card is $28. Beginning in April, you can log on to your application portal to pay for the charge. For students starting in the Summer, photos must be uploaded by May 1st. For students starting in the Fall, photos must be uploaded by August 7th. Your Nursing School name badge will serve as your ID for clinicals. Your currently prox card will provide access for buildings or your EmoryCard account. The cost of the card is $3.00. You can log on to your application portal to pay for the charge. Photos will only need to be updated if they are older than two years. A complete list of required textbooks is available at the Emory University Barnes and Noble website. You can contact the store directly at 404.727.6222. Emory NetID, Password and Security – All Emory and Nursing School accounts use your Emory NetID and Password for login. These will get you into all of your Emory accounts and should give you access to most computers and services on campus. NEVER GIVE OUT YOUR NetID OR Password. You must reset your Emory password at least once a year. The self-service portal for your password reset is https://mypassword.emory.edu/sspr. Your primary email address is your Emory NetID@emory.edu . Your email alias is what you normally use LastName@emory.edu . Emory Duo – Duo is a two-factor authentication system that Emory has implemented on multiple services to increase security. Duo is used for Emory email, OPUS, VPN and some PeopleSoft services. Duo is needed only when you are off campus using Emory services. For more information go to: https://it.emory.edu/security/services/two_factor/index.html OR the Duo self-service portal. Emory Technology Support - For support contact Library and Information Technology Services (LITS) at 404-727-7777 or go to the Student Technology Support at Woodruff Library. Emory email – login at http://email.emory.edu ; check your mail daily, account cannot be forwarded. Canvas – Go to https://canvas.emory.edu/ for login; Go to http://canvas-support.emory.edu/ for support; All Nursing courses are in Canvas. Check your courses frequently for updates. Emory Software - http://it.emory.edu/software/ Click on Software Express and login; this is software licensed by Emory for your use. If you do not have an up-to-date antivirus software on your computer download and install McAfee Antivirus. Also download and installEaglePrint driver for wireless printing on campus. Emory Unplugged wireless- Configure your computer and mobile devices to use Emory Unplugged wireless network. When you are on campus select Emory Unplugged network and authenticate with your Emory NetID and Password (see homework assignments). Emory Email on your Smart Phone – To put Emory Email on your smart phone follow Emory smart device security guidelines. You must: have a security PIN on your phone; allow your phone’s content to be encrypted; allow Emory to erase content of your phone if lost or stolen; and allow Emory to erase content of your phone if the password is entered incorrectly ten times. Information for Emory email to your phone or mobile device: iOS device or Android device. Have a Backup Plan – Back up your data frequently using Emory Box, Microsoft OneDrive (part of your Office 365 account), email or a separate backup drive. You must keep this up to date. Print, Copy FAX – Student printing and copying at Emory is managed via the Emory Card System. Please plan ahead and put money on your Emory Card. 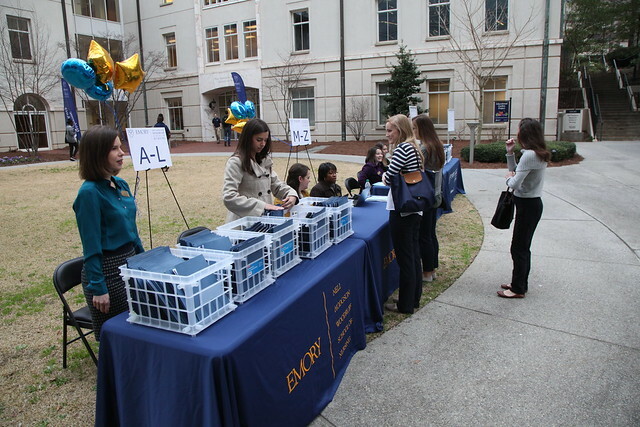 Go to http://studentfinancials.emory.edu/how-to-add-funds.aspx . Printing costs B&W $0.07 single-sided $0.10 double-sided; Color $.30 single and $.40 double. Scan to email and FAX is free via the printer outside room 101. EHR Tutor – EHR Tutor is a web based electronic health record training program. You will need to create an account and purchase a two-year license for $90. Go to https://my.ehrtutor.com/signup and sign in using your Emory Email address, create a new student account and select Emory as your school. ExamSoft – Your BSN courses are using a testing program from ExamSoft called Examplify. In Examplify you will log in, download exams, open and take them. When complete, the exams are uploaded for grading and posting. We will guide you through installing Examplify on your computer and taking a practice exam early in the semester. A smart phone with a data plan is required for all nursing students. You will be required to use your smart phone as a reference tool in clinical settings. Many wireless carriers offer a student discount. Verizon Wireless offers a 15% discount. AT&T offers a 15% discount on some charges. All smart phones and tablets are able to operate using Emory systems under these policy guidelines. Emory University offers secure WiFi on campus for all students. We recommend that you choose a phone with WiFi capability. Additional software may be required.